Want a perfect click? Meet your new favorite filter! Nykaa Get, Set, Click Creme to Powder compact in Iced Latte 01 is a complexion perfecter that hides away all skin imperfections in a single layer. This one-of-kind formula glides on as a cream and magically morphs into a powder, giving you a flawless complexion. Enriched with Biological Anti-oxidant pocket, it recharges your skin power-boosting anti-oxidants, leaving your skin refreshed and energized. With SPF 30, it acts like a shield and protects your perfected complexion. This breakthrough formula yields a soft matte finish that makes sure you are always camera ready! Iced Latte 01: This shade will suit fair skin tones with a pink undertone. Almond Drizzle 02: This shade will suit fair skin tones with a yellow undertone. Hazel Glory 03: This shade will suit fair to medium skin tones with a pink undertone. Sweet Caramel 04: This shade will suit fair to medium skin tones with a yellow undertone. Chestnut Crunch 05: This shade will suit medium to dark skin tones with a pink undertone. Mocha Madness 06: This shade will suit medium to dark skin tones with a yellow undertone. Cocoa Loco 07: This shade will suit dark skin tones with a yellow undertone. Alternatively, you can also find many more products from the Nykaa Get Set Click! 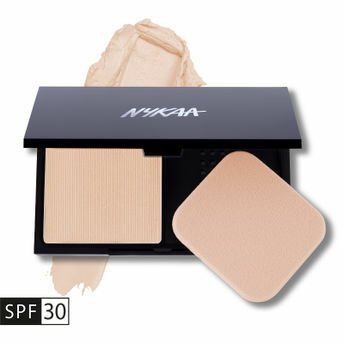 SPF 30 3-in-1 Compact, Concealer and Foundation range.